So how does Pinterest, the new site of such great affection and yet also blamed the "new facebook-esque procrastination tool" go together with being proactive and Classy Not Pricey? Yes, some people pin, pin, pin the hours away.... making boards full of what appear to be imaginary houses, closets, or levels of fitness. However, in the book, The Secret, the described value of having vision boards is tremendous. Focusing on what you want and envisioning yourself in that state can set you on the path to making those dreams come to life. That's part of the fun of pinning things you can only imagine! 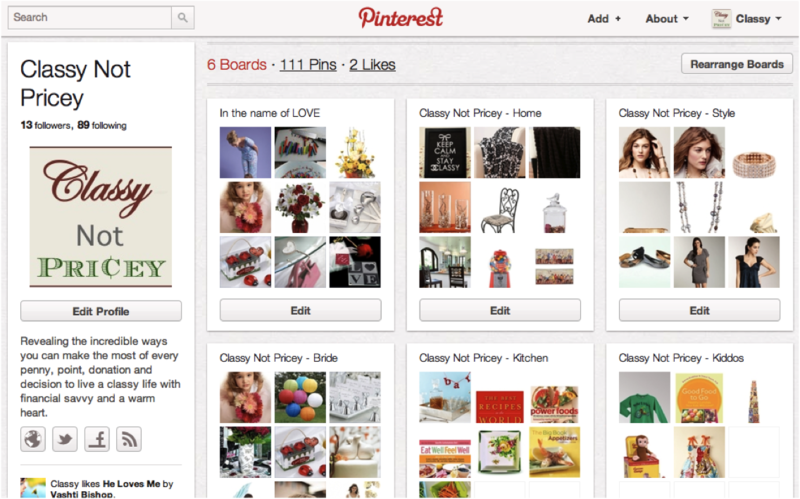 Even more than building vision boards, we love Pinterest because of all the ways it enables you to DO great things! Some people have already mastered pinning, creating what we call "cookboards" full of their favorite Pinterest recipes, finding and using patterns to make their own dream outfits, or discovering and following a great blog that supports their interests. 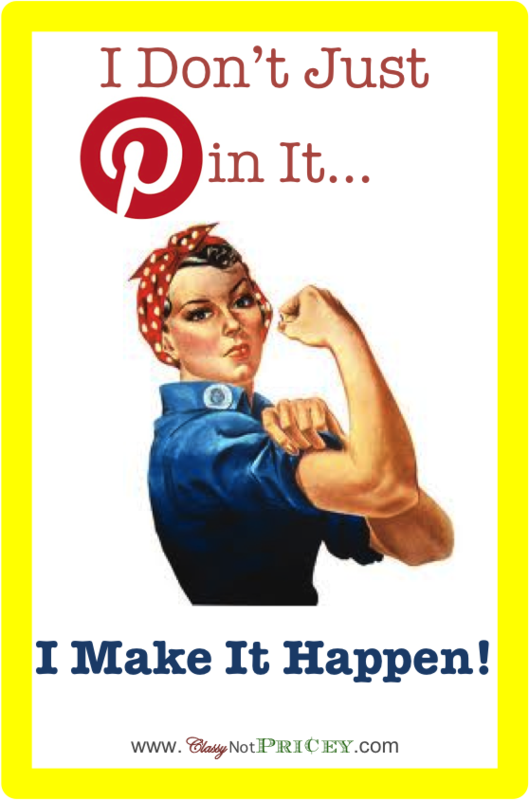 We encourage all you pinners to take action while staying focused on those goals, making your pinning even more valuable. To Set and Achieve Goals - Make a board created specifically for your goals, and pin things to it that don't just inspire you, but also give you the tools you need to achieve those goals! There are many inspiring photos pinned that lead to great websites and blogs with the "how to's" you need, such as achieving fitness goals, cooking techniques, or even learning a skill you've always aspired to master. Watch for those images that help your efforts along and repin away! To Find Creative New Ideas - Whatever your favorite hobby, be it reading, cooking, running, crafting, working out, writing, socializing, giving... there are amazing ideas on Pinterest to explore. Finding people you can follow that either create those ideas or are skilled at finding and repinning them for their followers is the first step. From there, you will slowly find the "voice" or "style" that ignites your creative juices, and either take the suggestions in the images or suddenly become flooded with your own! To Buy Wisely - There are SO MANY different pictures pinned of products every day, and many of the images link directly back to where you can purchase the item. This makes online shopping exponentially more fun and easy! However, there are often items pinned that are outrageously expensive and just plain out of reach. Try to leave those items for "vision" boards and focus on finding achievable alternatives. (Shameless Plug: If you follow Classy Not Pricey on Pinterest, we only pin items we think are well priced or can help you achieve certain goals. Check it us out HERE if you haven't already). To Pin Your Own Uniqueness - Take advantage of this unparalleled way to show your personality in a creative, bold format. Pinterest bursts the seams of Facebook when it comes to creatively expressing yourself and sharing your interests with others. Adding your own images shows your unique perspective of the world, and it's a great feeling when others see your pins and repin them to their own boards of inspiration :). If you have a blog or business, Pinterest is also a great tool to help others learn more about what you can offer. To Follow People Or Businesses That Inspire You - Unlike the character confines of Twitter, Pinterest is on the opposite end of the spectrum when it comes to spreading a message. Add together "a picture is worth a thousand words" with the freedom to add captions, comments, to repin with new words, or simply pin images of words, Pinterest adds thousands of words to a visual conversation. We like to follow people that pin positive quotes or stunning images that make us smile. And as the world grows more familiar with Pinterest, businesses and notable people are becoming more involved and easier to follow beyond their facebook pages or tweets. 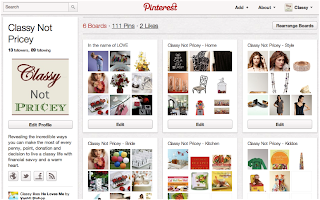 What do YOU think about Pinterest? Do you use it? What have you done that you wouldn't have before because of Pinterest?